Today the avalanche danger remains LOW for all elevations and aspects. As more snow and wind impact the forecast area tonight, pockets of MODERATE danger will form on the N-NE-E facing slopes steeper than 35 degrees in near and above treeline terrain. Continue to use normal caution in the backcountry. The strong southwest winds that have affected the region during the last 24 hours should continue through tomorrow. This increase in winds and in cloud cover since yesterday precedes the first storm in a series of storms forecasted to impact the area through the weekend. This first storm should arrive later this afternoon bringing much needed snow and more wind. With snow levels forecasted between 6000 ft and 6500 ft, the majority of the precipitation associated with this first system should fall as snow in the Tahoe region. The forecast calls for 5-10 inches of heavy wet snow above 7000 ft and 2-5 inches at lake level by tomorrow morning. Most of this snow should accumulate overnight with only about 2 inches expected this afternoon after 2 pm. Southwest winds should increase during this storm then diminish tomorrow morning during a brief break between storms. By tomorrow afternoon the second storm in this series should arrive. This storm has the potential for greater precipitation; however, some warmer air will also accompany the system. As snowfall increases tomorrow afternoon due to this second system, snow levels should climb up to around 7500 ft. As with the previous system, the most intense precipitation should occur during Friday night with only and additional 2-5 inches of snow forecasted for tomorrow afternoon. 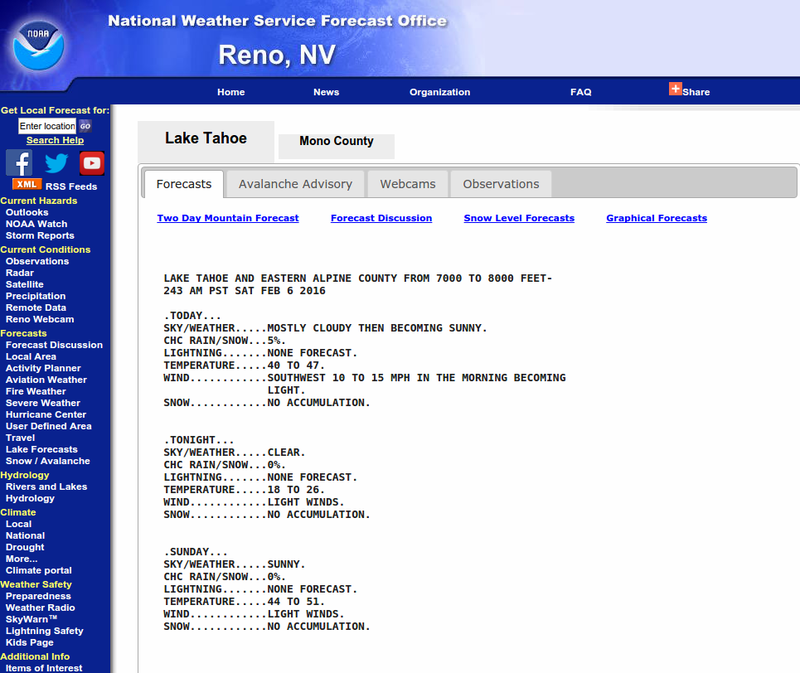 Click here for a more detailed online weather briefing from the Reno NWS. The snowpack remains highly variable both in structure and depth across the forecast area. Almost no snow exists on the W-SW-S-SE aspects, and limited snow coverage resides on the NW-N-NE-E aspects. In the southern part of the forecast area and east of Lake Tahoe, wind scouring earlier this season removed most of the snow from the exposed higher elevation N-NE-E aspects leaving behind areas of hard icy snow left over from last year and bare ground on these slopes. In a few small isolated areas, a mix of weak sugary snow with small hard slabs on top of it does remain. Farther north along the Sierra Crest, a deeper snowpack exists on the northerly aspects. In these areas rain and warmer weather formed strong frozen crusts on the snow surface. As colder weather returned, weak faceted snow reformed both above and below these crusts. Areas where strong melt-freeze conditions exist throughout the entire snowpack have become increasingly isolated. Yesterday on Silver Peak, a variety of these conditions existed with a weak rain crust with large facets below it, a snowpack composed of strong, frozen melt-freeze snow, and a medium strength rain crust with facets above and below it present within a few hundred yards of each other (photos and more info). Observations on Castle Peak the last two days have shown a snowpack consisting of a mix of strong rain crusts and weak facets (snowpit 1 + video, snowpit 2). Today's additional two inches of snow should not cause the avalanche danger to increase; however as more snow and wind occur overnight new wind slabs will form. These wind slabs will form on the on top of the existing snowpack that has a variety of possible weak layers ranging from a thin layer of weak snow above the crusts to weak facets below breakable crusts. This combination will provide the necessary ingredients for avalanche activity. The crusts will serve as great bed surfaces, the thin layers of weak snow around the crusts as weak layers, and the new snow could form slabs. Pockets of MODERATE avalanche danger should develop tonight on the most heavily wind loaded N-NE-E aspects near and above treeline. In these areas human-triggered avalanche activity should become possible by tomorrow morning. As more precipitation occurs over the next few days the avalanche danger will increase and become more widespread. Cautious travel habits and careful snowpack evaluation in the backcountry during this storm cycle can help prevent people from being involved in dangerous avalanches. 0600 temperature: 27-32 deg. F.
Max. temperature in the last 24 hours: 27-36 deg. F.
Weather: Cloudy with snow developing after 2 pm. Snow levels between 6000 and 6500 ft. Snow with snow levels dropping to lake level. Chance of snow in the morning, then snow and rain in the afternoon. Snow levels around 7500 ft. Temperatures: 32-39 deg. F. 24-31 deg. F. 34-41 deg. F.
Expected snowfall: up to 2 in. 3-7 in. 2-4 in. Temperatures: 31-36 deg. F. 23-30 deg. F. 31-38 deg. F.
Expected snowfall: up to 2 in. 4-8 in. 2-5 in.